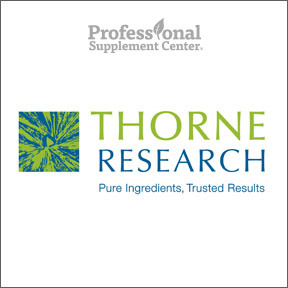 For well over three decades, Thorne Research has been dedicated to providing innovative, research-based, high quality nutritional supplements designed for enhanced wellbeing. With a commitment to integrity, Thorne Research’s mission remains to deliver responsible wellness solutions to improve the health outcomes of people around the globe. Thorne Research ensures exceptional quality and manufacturing excellence of all their products based on stringent specifications and purity standards, verification and advanced technology testing of all raw ingredients and full compliance with FDA regulated current Good Manufacturing Practices (cGMPs). Additional certifications include NSF International, NSF Certified for Sport®, USDA Organic and the Therapeutic Goods Administration (TGA) of the Government of Australia. In cooperation with prestigious medical groups and research institutes including the Mayo Clinic, Emory University, MD Anderson, and the Universities of Arizona and North Carolina, Thorne Research conducts clinical research and randomized controlled clinical trials utilizing pharmaceutical-based models to study and investigate the physiological effects of a variety of nutritional supplements. Their ongoing, unwavering and diligent commitment to quality control, purity, efficacy, and verification of label claims demonstrates that Thorne Research’s dedication to improving patient wellness is much more than just a mission statement. Basic B Complex – This optimally balanced active B complex provides bioavailable forms of 8 synergistic essential B vitamins in support of cellular energy production, healthy red blood cell formation and healthy neurological function. Gluten, soy and dairy free, Non-GMO vegan formula. Meriva-SR Curcumin Phytosome – This potent antioxidant complex provides highly bioavailable curcumin and phosphatidylcholine in a unique, patented time-release formula. Meriva-SR helps to maintain a normal inflammatory response, provides support for joint and cardiovascular health and aids in hepatic detoxification. Gluten and dairy free, Non-GMO vegetarian formula. Contains soy. Basic Prenatal (VMP) – This high potency complex provides bioactive vitamins and minerals in a comprehensive and highly absorbable formula for the optimal health and nutrition of mother and baby. Formulated for superior utilization with specific nutrients that may aid in alleviating morning sickness common during the first trimester. Gluten, soy and dairy free, Non-GMO vegetarian formula. No artificial ingredients, flavoring or coloring. This entry was posted in Home and tagged Basic B Complex, Basic Prenatal (VMP), Meriva-SR Curcumin Phytosome, Professional Supplement Center, Thorne Research, Vitamins and supplements, www.professionalsupplementcenter.com. Bookmark the permalink.